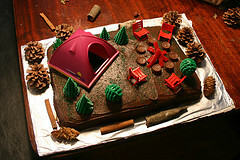 A camping cake is the perfect thing for a campout slumber party or camping party! Create your favorite camping scene - trees, rivers, streams, rocks, and of course a tent! Have fun recreating a fond memory with toy size camping gear or camping theme cake toppers. Another fun cake idea is to use cake picture - where a photograph is made into an edible image. Just place a camping scene or nature scene on the cake!